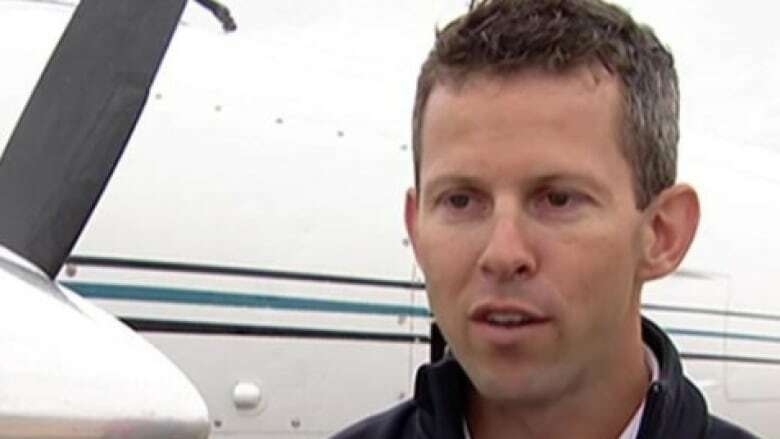 As storm clouds above Calgary grow heavy with the threat of hail and lightning, Jody Fischer and his team don't run for shelter — they run for their planes. 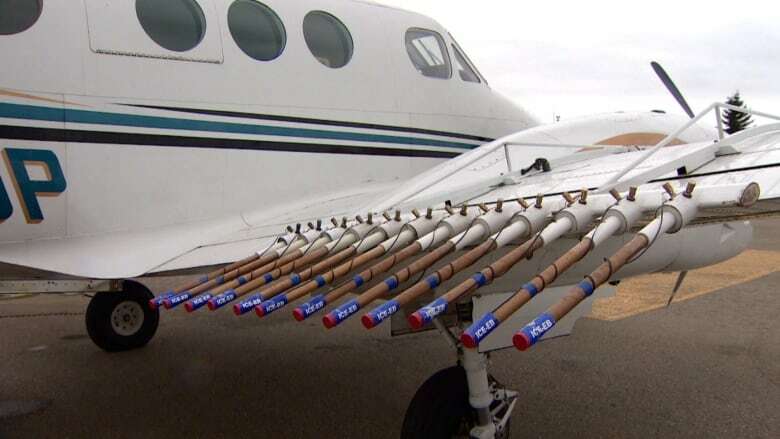 Fischer is one of 11 pilots who fly into the eye of brewing thunderstorms to fight growing hailstones for the Alberta Severe Weather Management Society. Ultimately the work is meant to reduce property damage and save Albertans and insurance companies millions of dollars. 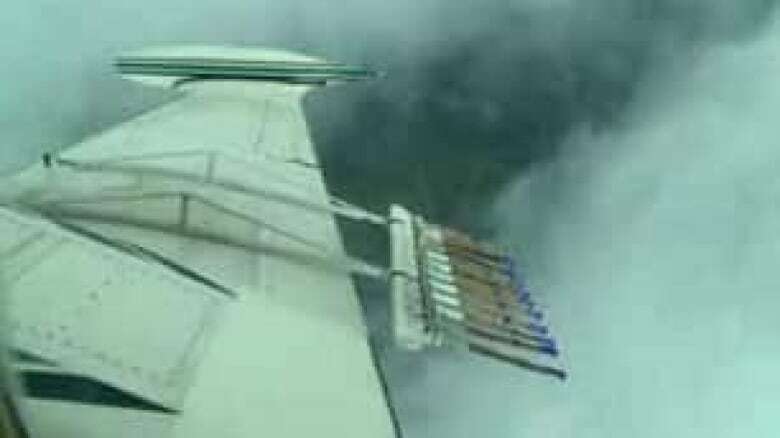 On certain days, Fischer nestles his plane directly underneath the thunderstorm and flies beneath it for hours at a time, which is called bottom seeding. "Since you're under the storm, it's kind of dark, ominous looking," he told CBC's The Homestretch. "That type of flying is typically very smooth and quiet." On other days, Fischer flies directly into the eye of the storm, navigating updrafts as he searches for the clouds and water that feed into the main cell. When his plane begins to rock back and forth with the gusting winds, and as streaming water begins to freeze along the plane's surface, Fischer gets ready to fire. "We know we're in the right spot, and then we do our job. When we're in that updraft, we push that button," he said. Three- to four-centimetre long flares then shoot out from the underbelly of the plane, releasing silver iodide that burns up through the cloud. These newly introduced particles provide additional surfaces for moisture in the cloud to crystallise around. This means more but smaller hailstones are formed. "We're flying on the edge of the storm," he said. "It's bright, white, and we're going in and out of the clouds, so it's quite bumpy, and it can be dangerous if you don't know where you're going and you don't know what you're doing." In 16 years of flying, Fischer's plane has been struck by lightning once, but he said he's not "overly concerned" about a repeat occurrence while seeding. "That doesn't typically tend to be where the lightning is concentrated. It's usually where all the ice crystals in the anvil of the cloud is," he explained. Fischer is the chief pilot for Weather Management Incorporated, a company based out of Fargo North Dakota that has been doing this kind of work since the '60s. In an average summer, pilots spend 30 days seeding, hitting 90 storms, said ASWMS project director Terry Krauss. In June and July, ASWMS seeded 74 storms in 25 days. Fischer said he has been increasingly deployed to missions in Alberta in recent years. "For sure, this is the most hail that I've seen on any of the jobs I've done," Fischer said. "It seems like the weather patterns here have increased in the number of storm days and the number of big storms. We tend to fly more and more every summer."